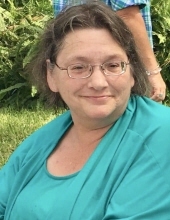 Age 58 of Oakley passed away on Friday, March 29, 2019 in Saginaw. A funeral service will be held at 1:00pm on Tuesday, April 2, 2019 at Nelson-House Funeral Homes Martin Chapel. Burial will follow at Ridge Road Cemetery. The family will receive friends at the funeral home from 11:00am until the service. Karen was born on March 4, 1961 to Erwin and Sarah (Larkin) Smith. She graduated from Owosso High School. She married Dwayne L. Nixon on January 10, 1981 in Henderson; they celebrated 38 years of marriage this year. Karen worked for the Argus-Press for many years. During her life, she enjoyed planting flowers in her garden and spending time with her family. Karen is survived by her husband, Dwayne Nixon; her children, Brandi Nixon (Steven Millard), Patricia (Steven) Davis, Matthew Nixon, and Jonathan Nixon; her grandchildren, Chloe Davis, Connor Davis, Steven Davis II, Mackenzie Millard, Aiden Millard, Ellie Nixon, and Gabriella Nixon; her father, Erwin Smith; her mother-in-law, Delores Nixon; her sisters, Sharon (Randy) Jensen and Christine Allen; her brother, Steven (Karen) Smith; her brothers-in-law, William Nixon and Kevin Nixon; her sisters-in-law, Annette Lollis, Deanne (Brad) Groll, and Kristina (Jim) Newport; as well as many nieces and nephews. She is predeceased by her mother, Sarah Smith; her brother, John Smith; and her father-in-law, William Nixon. To send flowers or a remembrance gift to the family of Karen Ann Nixon, please visit our Tribute Store. "Email Address" would like to share the life celebration of Karen Ann Nixon. Click on the "link" to go to share a favorite memory or leave a condolence message for the family.